Fall is loved for its beautiful colors and it is just as wonderful to enjoy those same colors inside your home as well. You can use real and fresh leaves (as in the vase above) or dried magnolia leaves, with their rich color combination of copper and green for the perfect look and colors of Fall. If you use the preserved leaves, you can carry that element into the next season too. 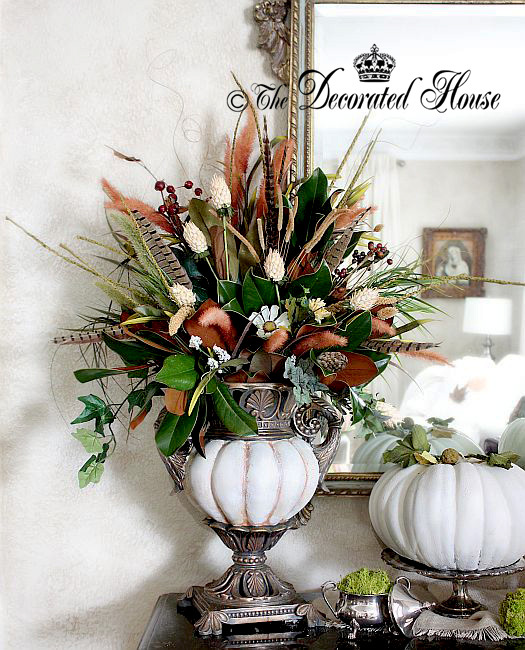 Almost everything in the vase is from nature - dried flowers, leaves and feathers along with only a few faux leaves here and there to fill it out. So depending on where you live, you might find everything you need for a pretty arrangement right outside your door! Previously I have shown you the magnolia leaf candle wrapped with the leaves all facing on the copper side, and also with the with the copper alternating with green. You gather from Nature and your garden to create a simple, or even more elaborate arrangement than this one. Here I used the candle in a white concrete garden container. It was filled with a floral foam so I could easily stick the leaves, berries and picks into it. It was covered with moss so you can't see the foam. The pumpkins can be painted with either flat white paint, or chalk paint. 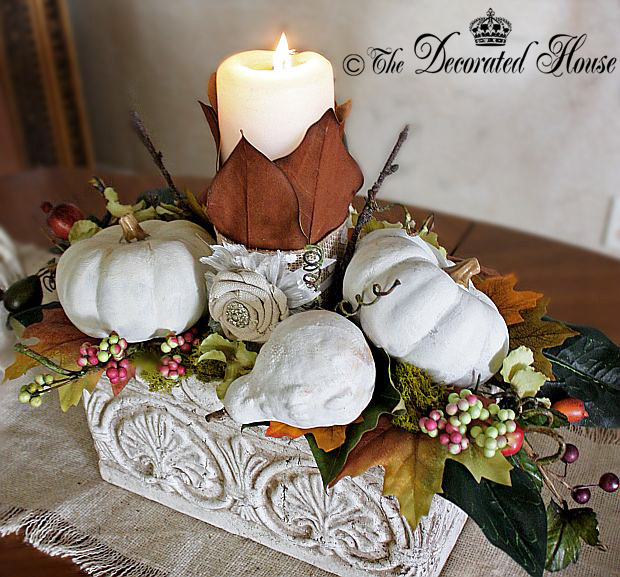 The candle arrangement is on the dining table, but it can easily be moved to your coffee table when it's time to get the table ready for a dinner. For the entry table it was simple to remove all the Halloween related elements and keep everything that felt like Fall. 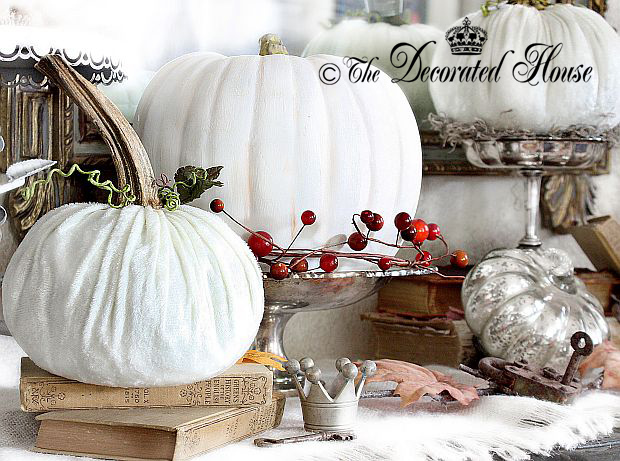 The antique books and rusty lock are a wonderful balance of autumn colors against the shiny silver and the white pumpkins. The pumpkins are a mixed of painted, mercury glass, and velvet ones, giving you a nice range of textures to add more interest. all your arrangements are beautiful. Thanks for your lovely comment. Happy Holidays! Wow! Your arrangements are gorgeous! Thanks for stopping by and leaving such a nice comment. Happy Holidays! So pretty Donna as always!! Where is Mr. Coty Bear...want to see him dressed in his holiday finest!! So sweet to see you. Cody Bear doesn't get too excited about dressing for the Holidays, but he certainly has a keen attention to the details of cooking and baking! LOL He loves to help in the kitchen. We will be by to see if Beau gets gussied up! Thanks for coming by.